We provide in particular legal services for the purposes of large investment projects both in the industrial and service sectors. We support our Customers at the investment stage and provide them with day-to-day legal assistance upon starting the operations. A lot of our Clients benefit from state aid and operate in special economic zones. 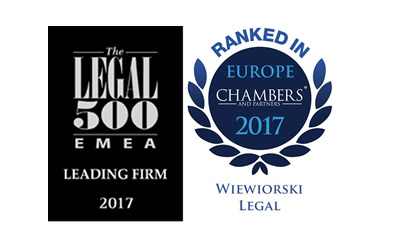 Wiewiórski Law Firm is particularly experienced in managing relations with government and local government agencies responsible for servicing foreign investments. Within the scope of our services, we have developed those areas of expertise that prove to be of crucial importance to foreign investors and major Polish entrepreneurs, in particular those interested in international expansion. Apart from the issues relating to the commencement of investment projects in Poland, these are matters connected in particular with labour law (including the rights of trade unions), state aid, real estate issues and legal aspects of the financing of Companies. Wiewiórski Law Firm provides services in the Polish and English languages. At a Client’s request, we can also communicate in Spanish and German. Wiewiorski Legal provides its clients with comprehensive legal services. In this section we present a list of our main specialties. In areas that are beyond the competences of our lawyers, we use external consultants.